I have always been fascinated by bees – not surprising as the medium I primarily work with is bees wax based. 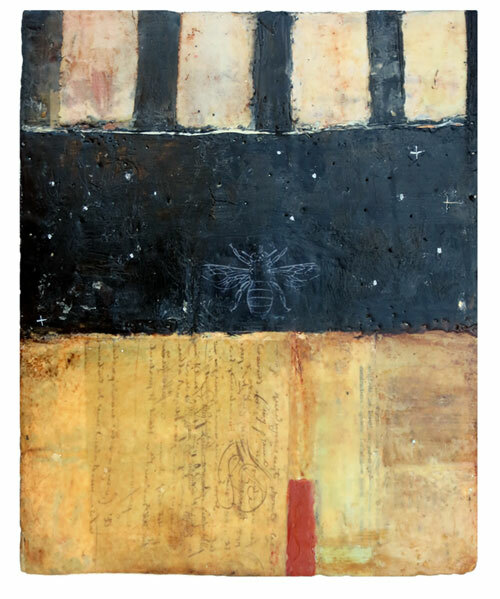 For years the humble little bee has showed up here and there in my mixed media paintings and then not so humbly in my environmental installations. As a gardener, a naturalist, and a cook it also makes sense that bees are creatures that I would find intriguing as they are responsible for so much of our food supply and for the flowering of our gardens. Perhaps my interest began when I was a little girl and my mother would tell me stories about her beloved father who was a minister who also kept bees. He also was a poet. It makes sense to me that the bees also loved him and that he took care of them. What I find so interesting is how the bee symbolism shows up in so many cultures across different ages in their religions and folklore. Humans have long known the importance of the bee to our life on this planet. I wonder when that knowledge was forgotten and/or discarded? Can we reconnect the dots – that our health depends on these creatures, that we should consider that sacred? Maybe we have forgotten what sacred means.